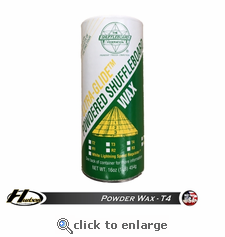 This is a very fast shuffleboard wax, which is used in competition. It is recommended for 22' shuffleboard tables. To keep your shuffleboard table in top condition, we suggest using the 1򈭿 Shuffleboard Cleane and 1򈭿 Shuffleboard Polish/Wax once a month and the Super Slick Silicone Spray every week.